Passport to Texas » Blog Archive » Same Day. Different Day. What? Make plans to observe National Wildlife Day on February 22. Why tell you about it today? Well, until this year, we’ve observed it every September fourth for more than a dozen years. That doesn’t mean you can’t celebrate today. Just as every day should be Earth Day. Why not recognize every day as Wildlife Day? Think about it. What would your world look like if there were no birds, insects, furry animals, reptiles, amphibians and fishes? Sort of sad, right? National Wildlife Day was founded by Colleen Paige, in memory of wildlife conservationist Steve Irwin—whom you may recall was The Crocodile Hunter. He died tragically on September 4th, 2006, when a stingray barb pierced his heart. Paige changed the date to his birthday: February 22. National Wildlife Day fosters global awareness of endangered animals, and the need for conservation and preservation. Whether you recognize National Wildlife Day on February 22 or today, you can observe it by visiting zoos where biologists work to save endangered species like the Houston Toad and Horned lizard. Or by simply meandering along a Texas Wildlife trail counting the animals you see. Some funding for preservation of the horned lizard and Houston toad comes from the sale of the horned lizard conservation license plate. Learn more about endangered and threatened species on the Texas Parks and Wildlife website. 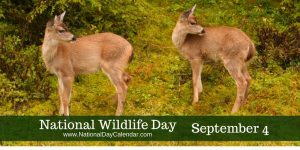 This entry was posted on Tuesday, September 4th, 2018 at 12:00 am	and is filed under Events, Wildlife. You can follow any responses to this entry through the RSS 2.0 feed. You can skip to the end and leave a response. Pinging is currently not allowed.